When will be Guy & Hunter's European Vacation next episode air date? Is Guy & Hunter's European Vacation renewed or cancelled? Where to countdown Guy & Hunter's European Vacation air dates? Is Guy & Hunter's European Vacation worth watching? Guy Fieri and his eldest son, Hunter Fieri,embark on the ultimate food-filled adventure on Guy & Hunter's European Vacation, premiering Friday, February 5th at 10pm ET/PT on Food Network. Viewers have seen Hunter grow up on Diners, Drive-Ins and Dives and Guy's Big Bite. Now, for his high school graduation Guy is giving him the experience of a lifetime - a vacation to visit 13 different cities in seven European countries to fully discover a whole new world of cuisine. It is an international culinary journey throughout the five half-hour long episodes, as the father-son duo discover the origins of quintessential delicacies from England, France, Germany, Greece, Italy, Spain and Switzerland. Guy helps make Parmigiano-Reggiano in Italy, where later, he and Hunter learn about the years-long process behind curing and aging prosciutto. Also: real Swiss fondue in Switzerland. Guy Fieri and his son Hunter continue their culinary adventure through Europe with a visit to Germany, where they learn to make authentic pretzels and France, where they learn the intricate tradition behind making true French croissants. Guy and Hunter visit London, where they learn an English tradition at one of the oldest fish and chips shops in the city and get a taste of authentic Indian food; the trip wraps up in Spain, where they are reunited with the rest of the Fieri family. Guy Fieri and his son Hunter embark on a food vacation that takes them to 13 different cities in seven European countries, including England, Germany, Italy, Spain and Switzerland. Highlights include authentic gyro in Greece and croissants in France. Also: The duo go lobster fishing, learn to make gelato, and take part in a lederhosen fashion show. 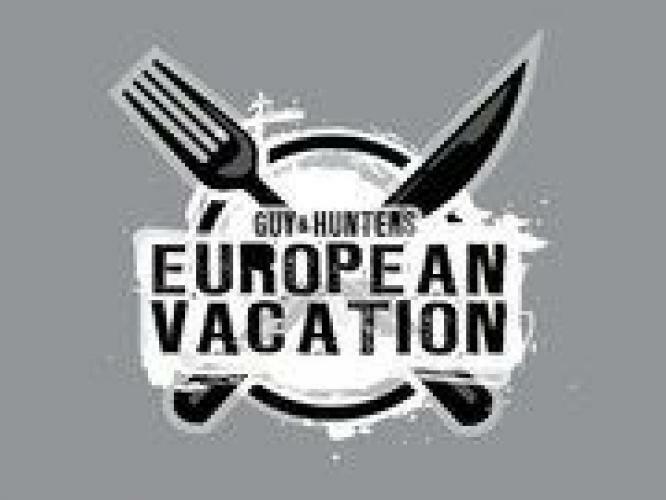 Guy & Hunter's European Vacation next episode air date provides TVMaze for you. EpisoDate.com is your TV show guide to Countdown Guy & Hunter's European Vacation Episode Air Dates and to stay in touch with Guy & Hunter's European Vacation next episode Air Date and your others favorite TV Shows. Add the shows you like to a "Watchlist" and let the site take it from there.